When I was growing up, my brothers were active in wrestling. Yes, I’ve talked about that before… but this isn’t a repeat story, I promise. My parents were great about encouraging us in our endeavors. They coached when they could (baseball, softball, etc) but also did non-event things that helped us with our specific goals. For anyone not involved in the wrestling world, weight is a total issue. No matter how you do during the week, if you wake up the morning of the meet and are too heavy during weigh-ins, then you can’t wrestle at that weight. So my mom always worked to keep my brothers healthy while also staying within their weight class. One way that she did that was to buy a yogurt making machine. This was at a time when yogurt choices at the grocery store were nowhere near what they are now. She made homemade yogurt and even added fruit to it to sweeten it up. Despite my mom’s greatest efforts, I don’t recall that being when I developed a taste for yogurt. No offense to my mom, of course. Now, we’re bombarded with different types of yogurt in as many flavors as you can imagine. Most are pretty good, too. Of course, some are healthier for you than others. 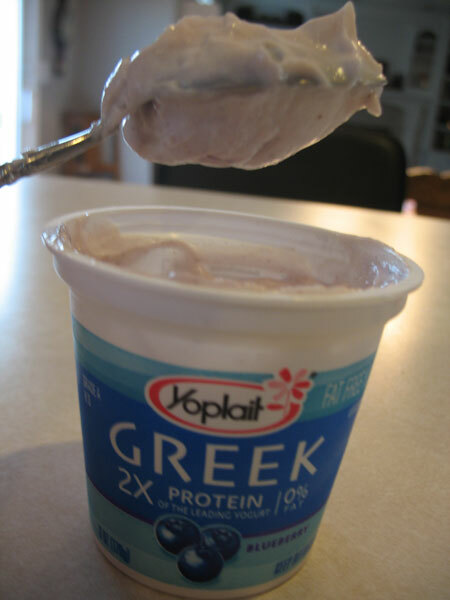 Recently, I’ve watched as slew of “Greek” yogurts hitting the shelves. 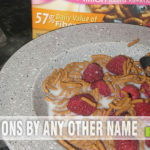 I received an offer from MyBlogSpark to review Yoplait’s introduction into this market and was shipped off a gift package along with coupons to purchase some at the store. 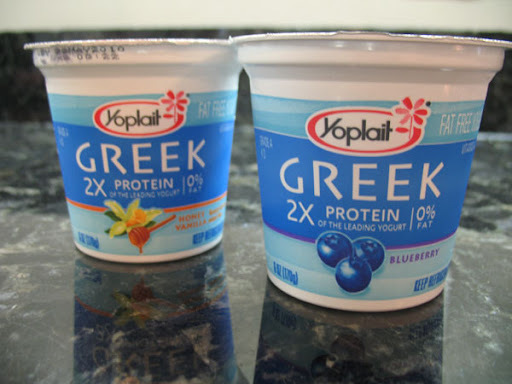 So off I went to the store… and I found two or three other Greek yogurts but no Yoplait. On my second trip to the local grocery store (after not finding it at two other locations), I finally located some. Literally only a few remained on the shelf – blueberry and honey. Blueberry yogurt has typically been my flavor of choice, seldom failing me. Honey? Wasn’t sold on that one but I bought it anyhow. Figured that since MyBlogSpark had provided me with a full-value coupon, I might as well try it. There are actually four flavors but the popularity of these has been amazing – at least at my store. I’ve yet to find Strawberry or Plain on the shelf. Even from the time I purchased mine, I’ve been to the store again and the shelves are barren. It’s double the protein of “the leading yogurt” and it has zero fat. Other than that, I didn’t much care about the nutritional facts… I needed to know how it tasted because if it wasn’t any good, it didn’t matter how healthy it was. What did I think? It’s thick. OMG is it ever thick. Like paste, thick. But I know some ice creams that can be held upside down and they taste great so I didn’t associate thickness with taste. However, honesty is a big thing for me, so I have to say that I wasn’t sold on the blueberry the first time I tried it. I have a pitiful sweet tooth and this certainly caters to the non-sweet-tooth-yogurt-lovers out there. After eating only half of the container, I covered it and put it in the freezer to use in a smoothie. I later tried the honey-vanilla flavor and despite the toned-down sweetness level, found it to be very tasty. Surprisingly refreshing, actually. So I gave the blueberry another shot and this time, it hit the spot. I think that it was simply a matter of my taste buds wanting something sweet that day. The fact that it isn’t as sweet is actually a selling point. When I’ve looked at recipes that used yogurt as a replacement for other ingredients, it almost always required “Plain” which I don’t like and won’t eat the remainder that isn’t in the recipe. 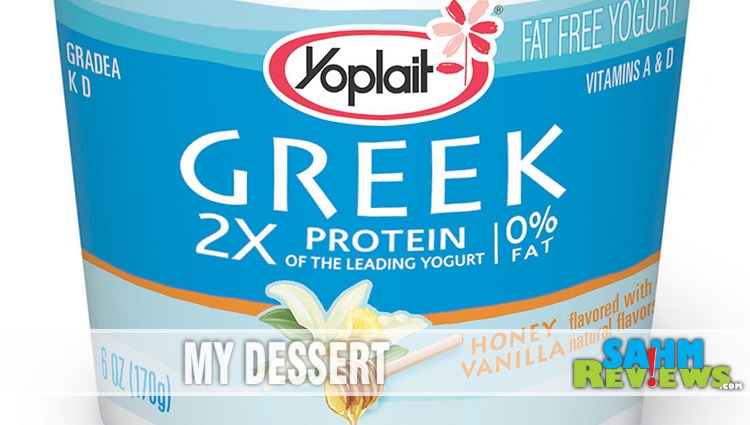 With the Yoplait Greek, I can see using the Honey-Vanilla in recipes as well as solo. As I said before, I really enjoyed the Honey-Vanilla flavor! It’s not an expensive yogurt, but it certainly isn’t a cheap yogurt, either. As I’ve said on previous reviews (and an upcoming one for another brand), I love various yogurts but I enjoy a great bargain, too. I’m very cost conscious when making purchases like this. It will be among my list of products to watch hit the sales flier. How about you? 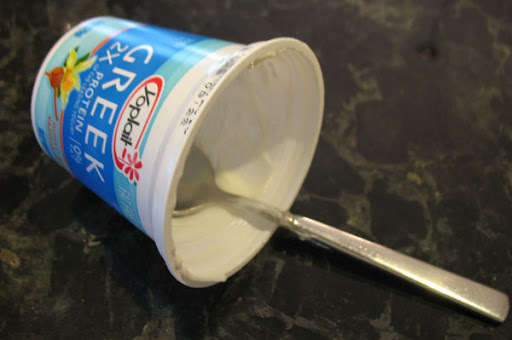 Have you tried Yoplait Greek yogurt? 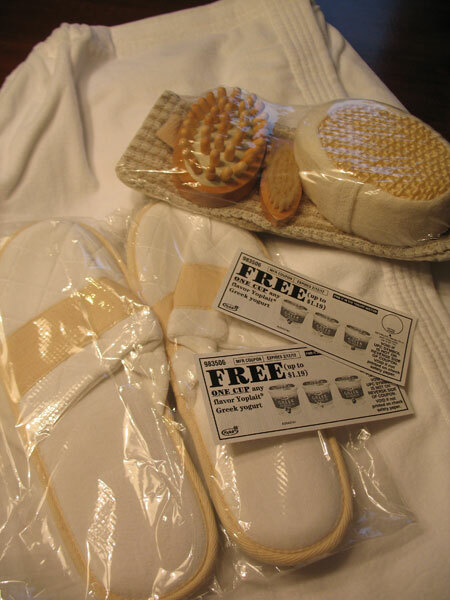 Here’s a chance to win full-value coupons for Yoplait Greek yogurt along with a nice bath gift package, too. Sometime on June 5, 2010, a winner will be chosen at random from all valid comments left. 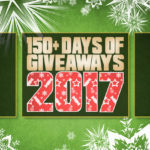 Winner has 72 hours from posting/notification to respond. If winner cannot be contacted, I will move on to the next random selection. I'd use it to make the Dill Yogurt Dip for sure! Yum! I'd like to try making Tzatziki. I already use yogurt in Lemon Pasta, and Greek yogurt would be even better! I'd love to try the savory white chicken chili! I would like to use the greek yogurt to make the Dill Dip- very yummy in the summer!